The Show™ is a party just waiting to happen. Imagine watching a movie while relaxing in the spa. The theater seating design directs everyone toward the focal point – the E-Suite monitor. But the monitor isn't the only star of the show – the Captain’s seat therapy arch is amazing! It pampers every inch from my neck down to my wrists and the sides of my knees. Plus, the two Adirondack chairs are just the spots for serious leg massages. My spa puts on quite a Show™. The Epic™ provides the ultimate hydrotherapy experience. It boasts three High Output Therapy (H.O.T.) Zones – lumbar, shoulder and pillar, and includes the dual geyser jet system that is beyond belief! The Epic's open, multilevel seating for six, features an exclusive Adirondack chair with powerful leg and feet jets. Super deep soak seat puts you as low as you can go and provides relief to your neck, and all along the spine. Exclusive to the Epic is the new Aroma Infusions to create the perfect ambiance. This hot tub is bound to be an Epic™ legend. The Euphoria™ comfortably accommodates a crowd with seven generous seats. Sink into the extra deep therapy seat and get a whole body massage, including wrists. Or catch the extreme leg massage in the Captain's chair – there's a seat height for everyone. One of the most unique aspects is the whirlpool therapy system - relax with passive therapy or move to massage all the hard-to-reach areas such as the chest and arms. Total relief is pure Euphoria™. The Wish™ lives up to its exciting first impression. Lounge comfortably with H.O.T. Zone shoulder, leg and feet massage. Or sink deep into the Captain's chair with H.O.T. Zone lumbar jets, hydrotherapy encompassing your body plus wrist jets. And speaking of therapy, the footwell and H.O.T. Zone pillar geyser jets really provide a powerful massage. Plus the curvaceous entry with an integrated step creates a fantastic focal point on your patio. This spa is your Wish™ come true. The Reward™ is the ultimate culmination of comfort, style, therapy and power. The contoured full-body lounge provides a serious massage from shoulders to legs and even the feet. The deep therapy seat provides stimulating action: neck jets, H.O.T. Zone shoulder jets and jets for the entire back. The second therapy seat features H.O.T. Zone lumbar jets for the lower back. But the extreme dual geyser jets make it the greatest Reward™ of all! Who needs to go on vacation when you have a curvaceous Resort™ in your own backyard? This two-pump model delivers exceptional hydrotherapy, especially to the legs. The open, multi-level seating for five features a lounge with H.O.T. Zone lumbar jets, an Adirondack seat with H.O.T. Zone shoulder jets and extreme feet jets, two deep therapy seats and an entry/cool down. Enhance your experience with Aroma Infusions and Adagio™ audio to create a tropical Resort™. The Spirit™ relaxes your mind and rejuvenates your body. It accommodates three people in comfort. The full body lounge pays extra attention to your shoulders, back, thighs and feet. The deep therapy seat works on all the back muscles. Plus, there's a cool-down seat to get you out of hot water. But the highlight is the H.O.T. Zone Therapy Pillars of whirlpool jets that really bring you to life! The super convenient 120V plug-and-play system helps to enhance your carefree experience. Renew your Spirit™ every day. The Rendezvous™ is the perfect spa for tight spaces – it tucks into a corner and virtually disappears. Plus the 120V plug-and-play system is the ultimate convenience. You may not believe it at first glance, but two people can settle into this spa and get a great massage. The deep therapy seat delivers a soothing neck massage while your partner enjoys a seat of their own. You may seek personal pleasure, but this is the perfect opportunity to Rendezvous™ with your honey. 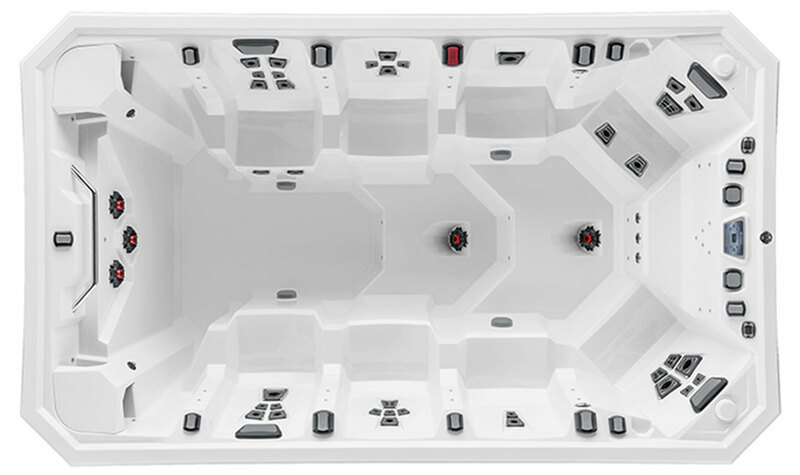 The Vegas Elite hot tubâ€™s unique seating positions provide comfort for six people and include two deep therapy seats, two side seats, one mid-level seat, a super-deep soak seat and a bonus entry step. But the real excitement is from the Whitewater-4 jet's explosive leg therapy and water wall! Stainless steel jet faces and foam-over plumbing come standard, with the option to add full-foam insulation. The Broadway Elite's creative seating arrangement features a wraparound seat for two, a super deep Director's Chair with fantastic leg therapy, another deep seat for total back therapy and two more seats at varying heights. Everyone in the house will enjoy the one-pump performance. * A soothing waterfall and optional Twilightâ„¢ LED lighting adds to the ambiance. Add the optional Motownâ„¢ audio system with Bluetooth to soak the night away like a true rock star. *Optional Two-pump Upgrade available: Adds a second 160 GPMpump for a combined flow rate of 320 GPM. The Monaco Elite accommodates a party of five. This throwback to the round hot tub days has a generous lounge with jets from neck to feet, two deep therapy seats with full-back therapy, and two bucket seats. With the convenient 120 volt plug-and-play system, you can locate it just about anywhere. Stainless steel jet faces and foam-over plumbing are standard. Available options include: full-foam insulation, Motownâ„¢ audio with Bluetooth, Twilightâ„¢ LED multipoint accent lighting, and 240V Performance Upgrade. Perfect by yourself or with a companion, Nashville Elite offers the luxury of a day spa in your backyard. It's a premium two person hot tub that lets you lounge as you whisper to your partner in the therapy seat next to you. The cool-down seat provides a third spot to linger. With the convenient 120 volt plug-and-play system, you can locate it just about anywhere. Stainless steel jet faces and foam-over plumbing are standard. Available options include: full-foam insulation, Motownâ„¢ audio with Bluetooth, Twilightâ„¢ LED multipoint accent lighting, and 240V Performance Upgrade. Dimensions: 60" x 84" x 29.5"
The Vegas hot tubâ€™s unique seating positions provide comfort for six people and include two deep therapy seats, two side seats, one mid-level seat, a bonus entry step, and a super-deep soak seat to get you submerged in hydrotherapy. The Nashville is the perfect personal hot tub for you and a companion. Lay back and relax in the lounge or chat up your partner in the therapy seat next to you. The cool-down seat provides a third spot to linger. The Nashvilleâ€™s 120 volt plug-and-play convenience is ultimately carefree. Or, an optional 240V Performance Upgrade is available to enhance your therapy experience. * When it comes to two-person hot tubs, The Nashville is Southern comfort at its best. The innovative Kona exclusive Whitewater-4â„¢ jets provide a wall of water to maximize your swim pace options and workout rigor. Class 4 white water is known as â€˜advanced' in the outdoor sports world. With Whitewater-4, you will feel the flow differenceâ€¦for real! The Kona's exclusive system design actually uses the Whitewater-4 jets to deliver water flow beyond the volumes created by the pumps, delivering up to 39% more flow than comparably sized jets available anywhere else in swim spas. The Kona ATV also offers a pair of mid-vessel Buoyancy jets that will deliver mid to lower torso lift during swim exercises. This provides a unique alternative dynamic to your body position in the water during your workout. Twin-end tethers and deep-water anchor points expand the versatility and variety of strength, resistance bands and conditioning workouts in 53 in. of water. If youâ€™re looking for the same resistance for rigorous workouts that the ATV-14 Sport offers, but want an expanded swim and workout space, the ATV-17 Sport is the vessel for you! It has more versatility for your swim and workout needs with an extra 3 ft. of length and 5 in. of depth (53 in. total water depth) than the 14 model. The ATV-17 Sport still includes 3 dual-speed pumps (160 GPM) to create a flow rate of 480 GPM to deliver swim workouts and strength and rehab conditioning exercises with low-impact on your body. Twin-end tether points offer more workout options with and against the flow. If youâ€™re looking for a greater flow and superior resistance for rigorous workouts, but still want the same compact size as the Splash, then the ATV-14 Sport is for you! The 3 dual-speed pumps (160 GPM) create a flow rate of 480 GPM to deliver swim workouts and strength and rehab conditioning exercises with low-impact for better health and wellness. Twin-end tether points offer more workout options with and against the flow. If youâ€™re a water enthusiast who wants a less intense (mild) swim, stretch, soak, or splash then the ATV-14 Splash is the vessel for you! The Splash operates off of a single 160 GPM dual-speed pump for a more relaxed flow for your aquatic activity. It is equipped with a single swim tether point and a resistance rowing option to provide versatile activity or relaxation for your lifestyle. The Vector21 Series V150 is a huge party spa combining the features of a hot tub and swim spa in one space-age vessel. This unique hybrid design features eight massage seats with world-class hydrotherapy, as well as two explosive Whitewater-4 jets in the foot well for powerful leg and foot massage. Equipped with three additional Whitewater-4 jets at the swim end, you will enjoy aquatic fitness with the fully-adjustable flow control. Add a single tether or optional rowing kit for even more workout variations. Gather your friends and family and get your party on!